O most amiable Lord Jesus Christ! We thank Thee for the great gift of faith and of devotion to the Holy Sacrament, which Thou didst grant to Thy beloved Teresa; we pray Thee, by Thy merits and by those of Thy faithful spouse, to grant us the gift of a lively faith, and of a fervent devotion toward the most Holy Sacrament of the altar; where Thou, O infinite Majesty! hast obliged Thyself to abide with us even to the end of the world, and wherein Thou didst so lovingly give Thy whole Self to us. Say one Our Father, Hail Mary and Glory be. R. That we may become worthy of the promises of Jesus Christ. 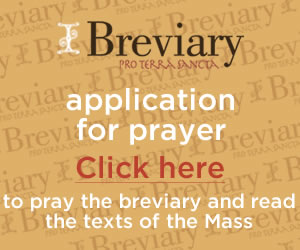 Let us pray: Graciously hear us, O God of our salvation! that as we rejoice in the commemoration of the blessed virgin Teresa, so we may be nourished by her heavenly doctrine, and draw from thence the fervour of a tender devotion; through our Lord Jesus Christ, Thy Son, Who liveth and reigneth with Thee in the unity of the Holy Spirit, God for ever and ever. Amen.